Growing up, there were certain trade-offs to having a summer birthday. True, you never got to wear the special birthday hat or bring in cupcakes to class like the kids born in February, but you also had a lot of options as to how to spend the long daylight hours of your special day. 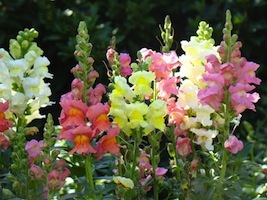 When it comes to flowers, folks born in the hot, sunny months of summer also have a lot of options. 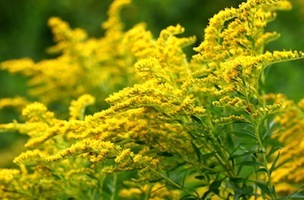 Long days and warm temperatures make summer the prime season for many locally-grown flowers and a great choice for a fancy birthday bouquet or vase of wildflowers is the bright and sunny solidago flower, more commonly known as goldenrod. Native to much of the United States, solidago is a wildflower that is a distant relative of the sunflower. It has tall, feather-like plumes of tiny, yellow daisies that form at the top of each stem in a pyramid shaped cluster. The shade of yellow can range from a light, buttery color to a deep, rich gold depending on the cultivar and many of these can be found growing in meadows and hillsides around the country. Florists will have solidago in stock year round, but it will be at its prime, producing blooms the size of an ice cream cone in the warm, summer months. Solidago has wrongly been accused of causing hay fever and allergies due to the fact that it blooms at the same time (and in many of the same places) as rag weed. Used by Native Americans for centuries, both the leaves and the seeds of this plant are edible and have been used as herbal remedies for kidney conditions. The natural latex produced in the slender but sturdy stems was used by Thomas Edison in his experiments with rubber and the tires on the Model T car given to him by his pal Henry Ford were actually made with material from solidago. An important source of nectar for bees, honey made from solidago is often dark and spicy-tasting and makes a great gift paired with a few stems of the flowers in a mason jar for a birthday present. Blooms will last for a week or more in fresh water and look great mixed in with iris, eryngium, delphinium, zinnias and other wildflower-like blooms. Solidago is the state flower of Kentucky and Nebraska and in the language of flowers, are considered a sign of good luck and good fortune. Unless, of course, you are a kid in school, which means when these sunny flowers are done blooming, summer vacation is almost over.